The TerMarsch family have been local entrepreneurs for decades. Originally from Pontiac, Michigan, they relocated to South Florida in the early 1950’s. What started as a small bin of fresh fruit under a hand painted sign on US #1 in 1959 has evolved into a multifaceted retail store in Juno Beach. “Grandma” and “Grandpa” TerMarsch left their legacy to their two sons Willy and Danny. Their children and grandchildren make up the three generations of the TerMarsch family you might see working behind the counter today. Stop by the store and you will always be offered a complimentary sample of fresh-squeezed Florida sunshine, and we will always make you feel like family. TerMarsch Groves has put their loyal customers first for decades! The TerMarsch family knows that customer service and shipping and stocking only the finest, freshest Indian River citrus is what is expected. We aim to exceed those expectations and offer many varieties of fruit throughout the citrus season. 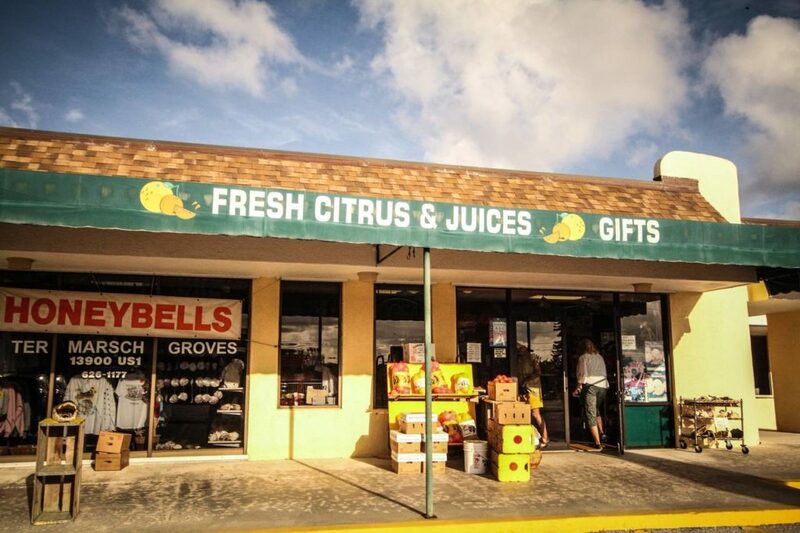 In addition to our fine fruit and juice, we have a colorful store full of uniquely hand-crafted jewelry, souvenirs, candies and marmalades, old Florida novelties and the area’s largest and most reasonably priced selection of natural coral and shells. Follow the link below to read the Wall Street Journal’s article highlighting the few remaining old Florida “Ma & Pa” businesses still in operation today. TerMarsch Groves was honored to have been featured as a local family owned and operated business. We appreciate your business over the years and look forward to the opportunity to continue to serve you here at TerMarsch Groves, where we are all family! Daughters Bonnie & Jenny, and other employees and family including Rebecca and Jessica (granddaughters), Suzan (sister) Jimi & Noemy, and Marty.